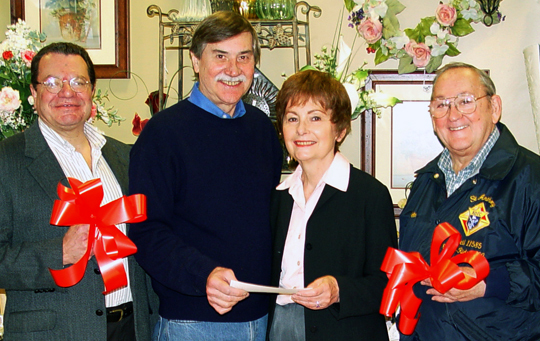 The Center for Food Action received a check on February 17, 2006 for $2,000 from Bill OShea during a brief ceremony at Bill OSheas Florist. (l-r) Martin Saccomano, Bill O'Shea, Thelma Fedele (Director of Emergency Services, Center for Food Action) and Peter Gallo Jr. The Center for Food Action (CFA) received a check on February 17, 2006 for $2,000 during a brief ceremony at Bill OSheas Florist , 231 Boulevard, Hasbrouck Heights. Area residents donated $10 to the Center For Food Action. Bill OSheas Florist provided a beautiful red ribbon with the contributors name on it. Contributors who donated $50 received embellished ribbons. The ribbons were placed on every tree and telephone pole along the Boulevard in Hasbrouck Heights (from Route 46 to Wood-Ridge), by Knights of Columbus Msgr. Fitzpatrick Council 7041, and in Wood-Ridge (from Hasbrouck Heights to Carlstadt), by Knights of Columbus St. Anthony Council 11585. The ribbons are removed after Valentines Day. The Center For Food Action is a non-profit food center that has served our areas needy since 1976. CFA always welcomes donations of basic non-perishable food items such as juice, cereal, canned goods, pasta, baby food, etc. The ribbons were generously donated by Harvey Jaffe of Designer Dispatch Ribbon and Floral Accessories.